I couldn’t stop grinning. Katy even said I’m radiating positively and have such a different attitude from my first few days here. As much as I do miss home, all my family and friends, and my dude Ralph, I think I’m finally on the path of understanding my inner self. Currently I can’t control my mind. I have nonstop chatter in my head and need some direction on how to change this. Yesterday the three of us signed up for a 10 day intro to Buddhism course in Dharamsala. For about $90 we are fed (apparently delicious food compared to our current situation), stay in dorm-like rooms, take courses on buddhism, and have guided mediation three times a day. The last two days of the course are intense meditation. Sounds amazing and I believe will be amazing, but one huge challenge: it’s completely silent. We can’t communicate with each other at any time of the day except one hour for questions and group discussions. I can’t imagine how crazy my mind is going to go in the first few days, but I think to finally learn how to mediate and control the mind will be extremely beneficial to me. As the cards and Sri Ma have said its time to listen to my inner voice and after 10 days I’ll be overly ready to share my experience. Hope you’re all enjoying the pictures and the insights of my mind, I think about you all everyday. 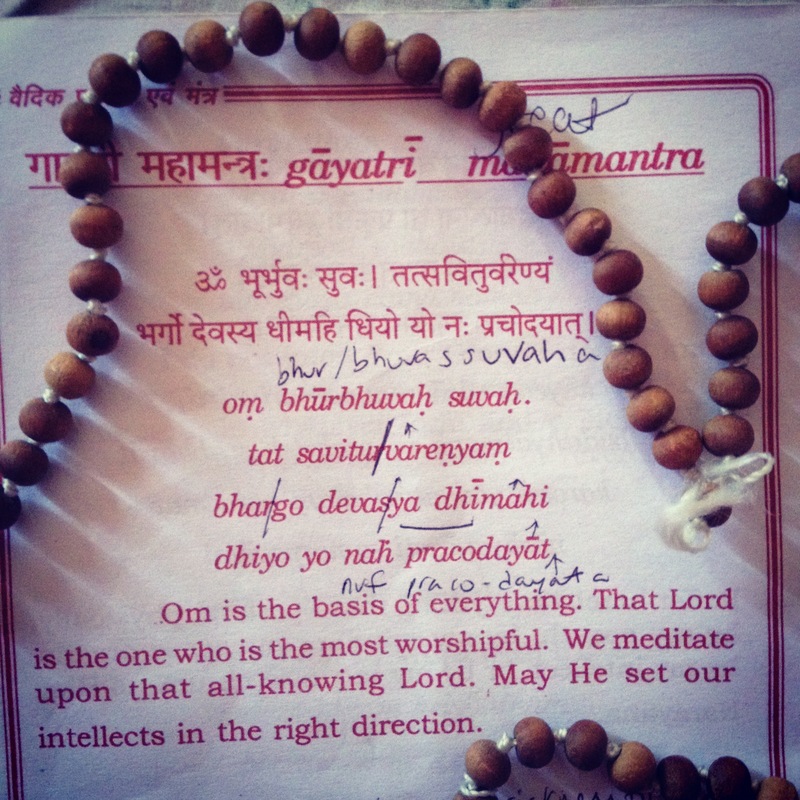 In chanting yesterday we sang the gayayti mahamantra 108 times. This is a form of meditation where you use the japa mala beads (which hold 108 beads)to count each mantra. As we began I thought how in the hell am I going to sit 100% still, spine straight, and chant this 108 times! Well I quickly decided to dedicate each chant to each of you one at a time. I smiled as I thought of you during the four verses and sent blessings from my heart and the next thing I know 45 minutes had flown by and I barely noticed my completely numb legs.